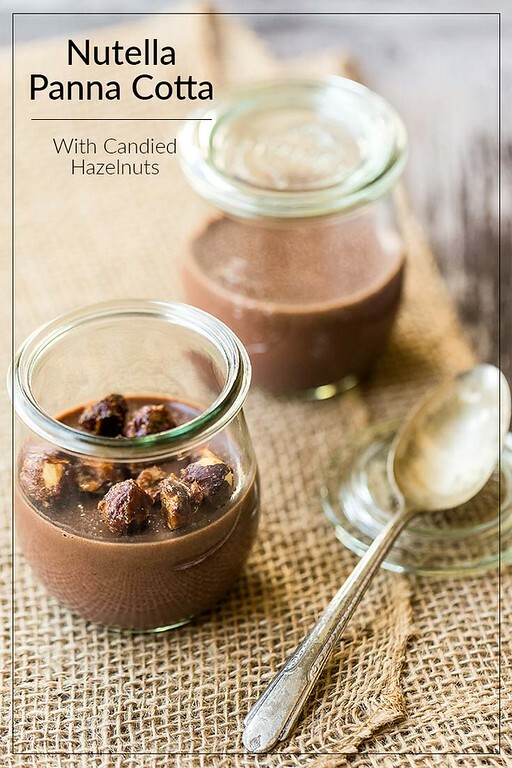 Why settle for a regular Chocolate Panna Cotta when you can easily make this Nutella Panna Cotta with Candied Hazelnuts? 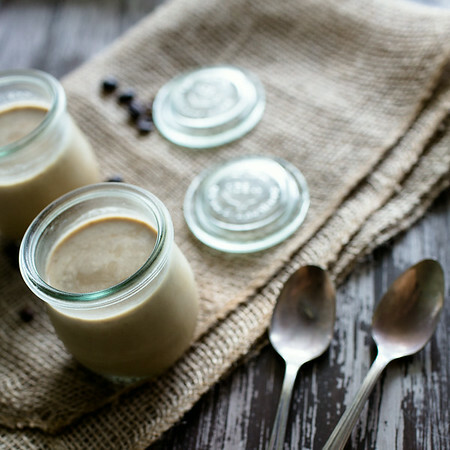 Panna Cotta is so easy to make, it’s sure to become your favorite dessert! 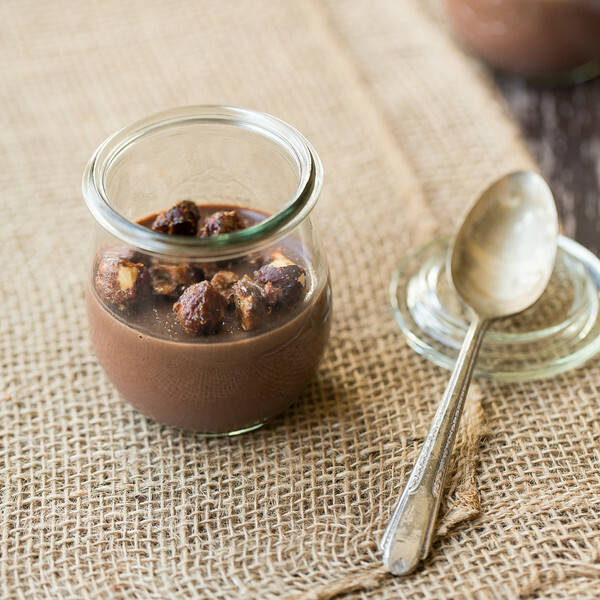 Click here to pin this Nutella Panna Cotta with Candied Hazelnuts now! I decided to first try Nutella in a Panna Cotta. I don’t know why Panna Cotta’s aren’t everyone’s go to dessert. They are so easy to make. Have you ever made jello? Well it’s basically like making jello only you are using a creamy liquid instead of a clear liquid. You can also think of it as sort of a pudding with gelatin added. This Nutella Panna Cotta with Candied Hazelnuts is so rich and creamy. It takes the Nutella to a whole new level! Then top it with some sweet crunchy candied hazelnuts and you have one of my most favorite desserts ever! You might want to serve it in some cute jars: Weck Jars, Mason jars, and Hexagon Jars. This Nutella Panna Cotta with Candied Hazelnuts is so rich and creamy with a satisfying crunch from the candied hazelnuts. Place 1/2 cup milk in a shallow bowl and sprinkle with the gelatin powder. Let soften for 5 minutes. While gelatin is softening, pour the rest of the milk into a saucepan on medium heat. Add Nutella and stir until Nutella melts and blends with the milk. Add the milk/gelatin mixture and stir until gelatin dissolves. Remove from the heat and stir in the vanilla and a pinch of salt. Pour into 6 ramekins (each will hold a 1/2 cup). Chill in refrigerator for at least 2 hours, but preferably overnight. While the panna cotta is chilling, make the candied hazelnuts. Preheat oven to 325. Line a baking sheet with parchment paper or coat with cooking spray. 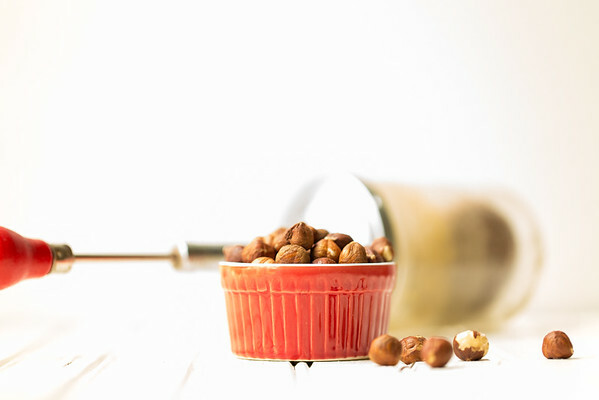 Combine hazelnuts with agave nectar, brown sugar, and a pinch of salt in a bowl. Spread in a single layer on the baking sheet, breaking up clumps. Bake for about 15 minutes. Remove from oven and cool completely on the baking sheet. Store in an airtight container. Must chill for at least 2 hours, preferably overnight. Yes, the hazelnuts were amazing! Oh you have me drooling! This looks so yummy and I would love to try it!!! My husband and son love nutella! I admit I was a bit perplexed by it when I first found out about it years ago (chocolate spread?) but how I know all the wonderful uses for it I love it too. 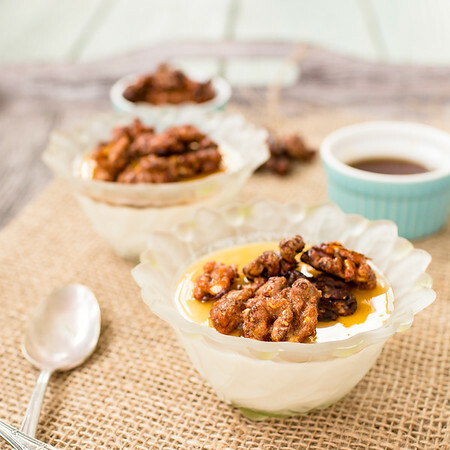 Your Panna Cotta looks amazing – love the candied nuts! Scheduled to pin. Thank you so much for sharing with us at Hearth and Soul, Pam. Hope to ‘see you again this week! Holy &$^! that looks good! I am going to make this a shovel it in my face so fast no one will get a bite! Everyone should have Nutella in their lives. 🙂 I love the combination of chocolate and hazelnut, so using nutella in a panna cotta sounds like heaven to me. The addition of the candied hazelnuts just makes the dish that more divine. I have had panna cotta on my must make list forever. Now seeing yours with Nutella, it is moving to the top! You have to try it. It’s so ridiculously easy! I guess I’m late to the party cuz I’ve never bought a jar of Nutella! I do like it though…maybe I’m afraid I’d eat the entire thing with a spoon! It’s never too late to get on the jar of Nutella bandwagon! this is the best version of a Panna Cotta recipe I have seen. Oh my, oh my, oh my. Nutella is my weakness in so many ways… Appreciate you bringing these to our Snickerdoodle Sunday link party and I hope you come back this weekend! You are the Panna Cotta queen. I love this one! I didn’t know about Nutella either, until a friend sent some to me because I was completely ignorant of its existence.This looks easy, and I”m sure the boys would love it! The trick would be planning a day ahead – not my strong suit. Oh, and I would totally just eat those hazelnuts, and not share. I love your little serving jars, BTW. After all these years, I still haven’t used Nutella in a recipe. Your dessert looks out of this world good! Hope your mom is on the mend. I am going to make this for my daughter. She will follow me around like a puppy do! Well, I’m sad that it took you so long to come around to nutella, but I’m so glad you finally did!! Mostly because now you’ve given me some serious panna cotta inspiration…MUST HAVE.